There were 240 head-on collisions in Oregon in 2011, according to Traffic Crash Facts. A total of 30 were fatal accidents and 171 caused injuries to occur. Many of these crashes occurred when drivers went into opposing traffic or drove on the wrong side of the road. Head-on car crashes caused by drivers who go the wrong way on the road are very serious and often fatal because there is more momentum and more force for the body to absorb when two vehicles strike each other directly. Understanding causes of wrong-way crashes can help Portland motorists to avoid these accident types and be safer on the roads. 182 crashes were caused by drivers who passed on the wrong side. 123 crashes were caused by drivers who turned into the wrong lane. 154 crashes were caused by drivers who were traveling on the wrong side of the road. 39 crashes were caused by drivers who traveled the wrong way on a one-way road. The use of alcohol, which National Transportation Safety Board indicates was a contributing factor in 60 percent of situations where drivers traveled onto the wrong side of the highway. Old age, which NTSB indicates is a significant risk factor once a motorist reaches age 70. For each decade older a driver gets, his risk of going the wrong way declines- until the driver reaches age 70. From 70 to 79, a driver’s risk of going the wrong way is 2.5 times greater than the risk of drivers age 60-69. After age 80, there is a 30 times greater risk a driver will go the wrong way. Unsafe passing, which causes almost five percent of wrong-way accidents according to Safety Transportation. The use of red reflectors. Improving the quality of pavement markings so it is easier for motorists to see exactly where they should be getting onto highways. A lowering of signs reading “Do Not Enter” or “Wrong Way.” Putting these signs lower down means they will be more in the path of car headlights and will thus be easier to see. Drunk drivers also frequently drive with their heads bent at a downward angle according to experts, which means a driver who is drunk could more easily see a lower “Wrong Way” sign than a sign that is higher up. 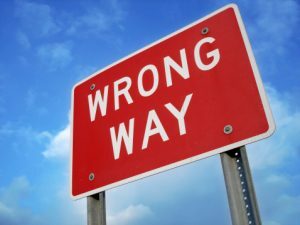 By considering these simple tips based on the common causes of wrong-way accidents, lives could be saved. Ultimately, however, drivers need to make sure they are not taking unnecessary risk which increase the chances of a collision.